So we’re taking the day to roam Seattle. First stop? The Seattle Public Library. And don’t even get into the “Geek. Nerd. Dork.” Speech with me. I know. I am presently at the Seattle Public Library, and I’d say all my dreams have come true but in order for them to really have come true I would have to be allowed to live here until I have gone through each and every book, magazine, and file. And that, blogosphere, would take years. I am so nerd happy at the moment. So in utter bliss. I have photos to share already. But I am not yet finished. And then they must be edited and chosen carefully. Soon. I will share with you and you too will love it, I hope. It’s just too beautiful! The architecture, the quiet busyness of everyone around. The books! Oh heavens the books! Public records, biographies, books on singing, Dictionary of Literary Biography!!! Yes. It deserves three exclamation points. The whole library does. So here they are. Books are everywhere. And from the reading room I can see the tops of adjacent buildings, the sky is oh so blue today not a cloud in the sky. I think I’ll accept this as gift Washington is offering. 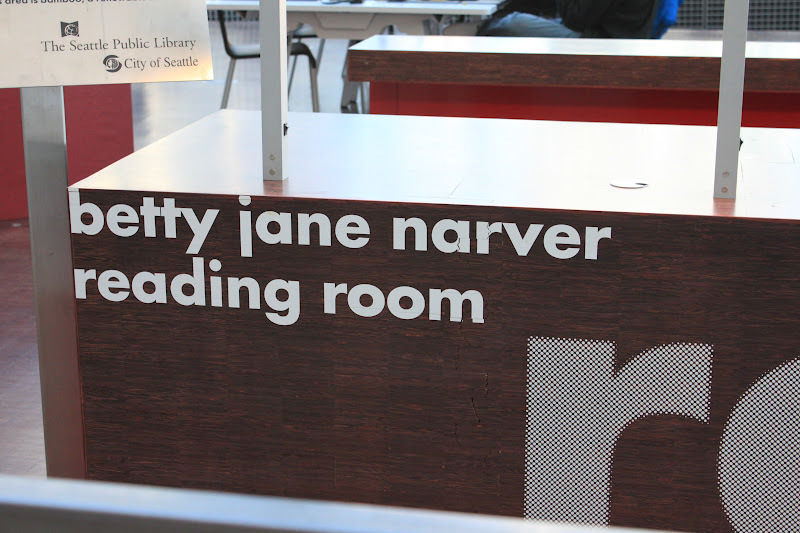 Being envious isn’t precisely my thing … but if there’s someone that is making me turn green right now … it’s this Betty Jane Narver lady … she. has. her. own. reading room! I’m off to get lost in aisles and aisles of colorful books. If you don’t hear from me again, it will quite possible be because I became a permanent resident of this glorious place. It could happen you know … I’d find a way. The Green Girl at the Seattle Library. P.S. They even have music practice rooms here! The sounds coming from there are delightful! Next Article As I Sit and Wait. I love our local library to bits. With so much library to love in Seattle, I might wander the aisles with my mouth hanging open for days. It sure is! And I had a great time! Being a librarian there must be thoroughly awesome! It's a great place, Caroline! I'm sure you guys would have a great time living in Seattle! Go there someday Jewels! It is amazing! Oh I missed those!!! How could I possibly have missed it! Argh! In Victor's words, we have to go again! Oh yes do visit it! You won't be sorry!! Great place, huh? I have a friend who is a librarian there. Hope you had a wonderful time! We might have to move to Seattle in the nearish future…good to know such a wonderful place would be waiting! Having never been to Seattle I feel like I'm missing out. A love of books will make your life so much more colorful and adventurous. You are a lucky girl. Best library in the world! Enjoy your visit and watch out for the strange talking eyeball on the escalators!